MARINA DEL REY — Boaters and local residents gathered at Marina del Rey’s Burton Chace Park community building Feb. 8 to voice their concerns about the recently approved Boat Central storage facility, planned for the harbor. The plan, one of four “Pipeline Projects” approved in an amendment to Marina del Rey’s Local Coastal Plan by the California Coastal Commission and the Los Angeles County Board of Supervisors last year, would construct an 80-foot tall dry stack boat storage facility capable of holding 345 boats on a current public parking lot and replace a current commercial charter fishing and cruise boat dock. The meeting offered an opportunity for the public to comment on the Draft Environmental Impact Report (DEIR) developed for the project and voice concerns before the final EIR is created later this year. Concerns raised during the evening’s meeting included the cost of dry stack storage, the displacement of fishing and charter boat companies that use the dock along Parcel 52, the elimination of free parking in the harbor and the potentially hazardous cross traffic that would be created by the facility’s overhang and close proximity the public launch ramp. “On a busy summer day, if everyone’s launching in H Basin in the same time, it’s going to create collisions,” said Jon Nahhas of the Boating Coalition. Nahhas added that Marina del Rey’s H Basin will get even more crowded if the planned 14,200-square-foot small boat center and storage facility at Burton Chace Park is added, as well. “You will have launching coming from the north (the small boat center), launching coming from the east (the public launch ramp) and launching coming from the south (Boat Central): That is danger,” Nahhas said. Located at 13483 Fiji Way along Basin H, the Boat Central project is approximately 4.2 acres in size (3.09 acres of land and 1.11 acres of water) and covers two parcels — Parcel 52 and Parcel GG. The center would consist of five main components, including the boat storage structure with 345 dry stack spots and 28 mast-up sailboat storage spots, 30 surface spaces for trailerboats, an office and a customer lounge, a two-story 6,335-square-foot sheriff’s department and lifeguard facility, a 2,200-square-foot boatyard, and a public promenade and view park. Currently, Parcel 52 contains 245 free public parking spaces, and Parcel GG is home to the soon-to-be demolished Marina del Rey Los Angeles County Sheriff’s Department boatwright/lifeguard facility, maintenance shop and maintenance/storage yard. After construction of the dry stack boat storage facility and office building, only 147 parking spaces will remain on the grounds — 50 spaces short of the required 197, according to the parcel’s parking requirements. Along the waterside portion of the future project is a dock utilized by charter fishing ventures and a separate dock utilized by the sheriff’s department. The existing dock and ramp facility is approximately 1,690 square feet, and it will be removed to make room for the boat storage facility’s 97-foot overhang and accompanying docks. Daniel Ginzburg of Fantasea Yacht Charters stressed the importance of finding a new home for charter operators, where they can pick up their customers, before the construction of the Boat Center project begins. Ginzburg added that he was encouraged by talks of possible dock alternatives to be created for charter vessels, but he stressed the importance of finding one before construction begins. “This project will not disrupt the existing charter cruise boat and sportfishing functions,” said Boat Central consultant Roger Van Wert. “That is a priority use in the marina, and those activities have to be provided for before this project can go ahead.” According to the report, the Boat Central project is scheduled to begin construction in late 2012, but Van Wert said construction isn’t expected to begin until the end of 2013. “There is time to work out a solution and implement whatever is necessary to accomplish that task,” Van Wert said. One possible new spot for the charter boats is near Fisherman’s Village, west of Basin H along the harbor’s main channel, but nothing has been determined yet. Once construction begins, the project is expected to be completed in about 11 months. The Draft EIR for the Boat Central project can be viewed at planning.lacounty.gov/case. Reference copies are available for review at the Lloyd Taber-Marina del Rey Library at 4533 Admiralty Way. Additional comments on the Draft EIR can be submitted through March 7 to Anita Gutierrez, Los Angeles County Department of Regional Planning, Special Projects Section, Room 1362, 320 West Temple St., Los Angeles, CA 90012 or emailed to marinaplanner@planning.lacounty.gov. 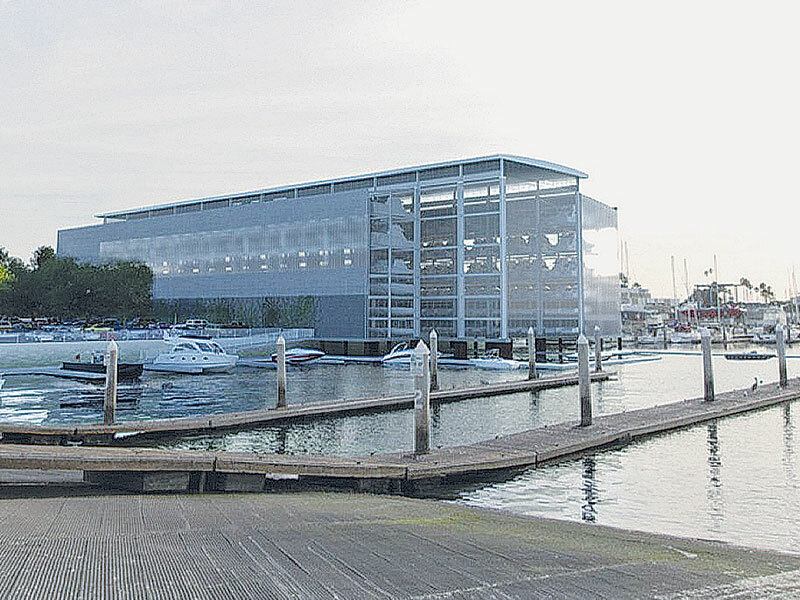 * The project would include 345 dry stack boat storage spaces, 28 spaces for boat trailers, and 30 surface spaces for trailerboats, including mast-up sailboats. The focus is on providing space for smaller boats from 20 to 35 feet in length, with the maximum size limited to about 40 feet. * The storage rack structure would stack boats based on demand, up to six boats high. The boat storage structure has been designed with an over-water component that facilitates the transfer of boats by a crane from the storage structure to the water and back again. The over-water feature is not unique to Marina del Rey, as other existing structures have over-water components. * The crane, which spans the central 60 feet of the dry stack boat storage structure and runs its length, would reach a height of around 81.5 feet. • Upon request or reservation, the boats would be delivered from the structure to the dock. A study based on Newport Harbor’s dry stack facility predicted that, even on peak days, no more than one-third of the boats would be taken out. * The boat storage structure would protrude into Basin H and overhang the water by approximately 45 feet on the eastern side and 97 feet on the western side.